A newly discovered comet is racing toward a mid-December rendezvous with the sun — a rendezvous that it will likely not survive. is a very special discovery to me as I have long been fascinated by the Kreutz Sungrazing comets; it has been over four years since my last discovery and I do hope the next one comes a lot sooner!" 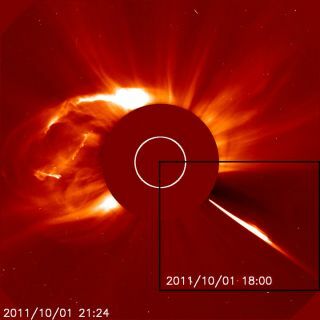 In fact, sungrazers are now routinely being discovered using the Large Angle Spectrometric Coronagraph on the Solar and Heliospheric Observatory (SOHO) satellite. In fact, SOHO is the most successful comet discoverer in history, having found 2,110 comets over 16 years of operation — an average of one about every three days. Absolutely anyone can join this project — all you need is an Internet connection and some free time. If you want to join the hunt, go to: http://sungrazer.nrl.navy.mil/index.php?p=cometform. To get a good view of Comet Lovejoy, reserve a seat next to your computer and stay tuned to the SOHO website: http://sohowww.nascom.nasa.gov/data/realtime/c3/512/. Joe Rao serves as an instructor and guest lecturer at New York's Hayden Planetarium. He writes about astronomy for The New York Timesand other publications, and he is also an on-camera meteorologist for News 12 Westchester, New York.